You must be reading this report because Kijojo.com was set as the home page on your browsers. In rare cases, computer users install this search tool willingly, but, in most cases, it acts as a browser hijacker. This means that it can enter the operating system and take over compatible browsers without permission. Most users understand that this kind of activity is malicious and unacceptable, but not all know how to delete this browser hijacker. We have found that this mischievous browser hijacker uses certain files to circumvent removal, but we have found a way for you to remove Kijojo.com in no time. It is highly unlikely that Kijojo.com will be introduced to you as a standalone application. Instead, the installer of this hijacker will be attached to other programs that you might be interested in installing. If you do not pay attention to the information provided and download software carelessly, it is very likely that you will download Kijojo.com yourself without realizing this. Once executed, this hijacker will replace the home pages on your Internet Explorer, Google Chrome, and Mozilla Firefox browsers. Luckily, there is a way to delete Kijojo.com from all browsers all at once. Our researchers have found that Kijojo.com can modify the Target of the infected browsers. This means that if you remove Kijojo.com directly from the browser, the home page will be hijacked as soon as you restart your computer. This malicious hijacker uses a file that is activated on startup and that has the function to check your browsers and see if you have attempted to delete Kijojo.com. If this file finds that the home page was replaced, it initiates hijacking all over again. Needless to say, this is a great obstacle that users need to overcome in order to remove the unreliable browser hijacker. 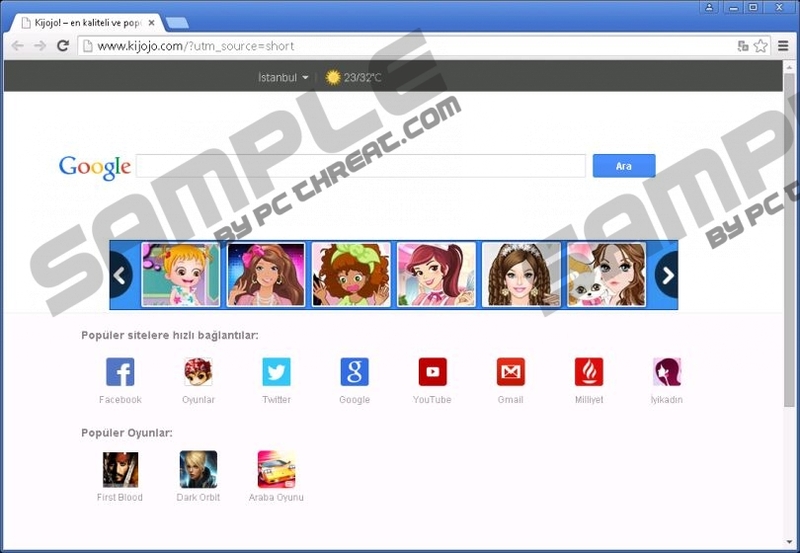 It was found that Kijojo.com is primarily targeted at users living in Turkey, but that does not mean that only Turkish users will have to suffer this irritating hijacker. Unfortunately, many users do not identify this search provider as a hijacker, even if it was installed without permission. First of all, Kijojo.com uses the credentials of Google Search when providing you with web search services. Secondly, it uses its own homepage to provide easy access links to such popular sites as facebook.com and youtube.com. Even though the links might be harmless, it might be risky to use Kijojo.com as a regular search tool because it shows ads instead of search results. This is the reason why most users remove this browser hijacker. Although undesirable search tools should be easy to manage, Kijojo.com is not a regular search tool. This is a malicious browser hijacker that you might have to delete using much more aggressive methods. As mentioned previously, Kijojo.com can affect the Target of your browsers, which might cause troubles deleting this hijacker manually. If you want to delete this threat manually, you have to find and delete Kijojo.com files first. If you do, it is very possible that your old home page will be restored automatically. Considering that manual removal is not simple, we also recommend installing SpyHunter. This search tool will delete Kijojo.com files and will restore your old home page. On top of that, it will eliminate other unreliable programs active on your PC. Install the automatic malware remover. Scan your PC to find the malicious programs. Click Fix Threats to delete malware. Quick & tested solution for Kijojo.com removal.